Conviction. It is a word that comes with an admission of guilt. And I must admit, I’m guilty. I try not to do it – not to give in to the temptation to judge. But I struggle. I often look to solve the issues of the speck-eyed people around me, often ignoring the large plank in my own eye in an effort to help point out the specks in others eyes. I don’t really try to help them out with it – I tend to stop at bringing the issues to their (or other’s) attention. And I would guess that I am not alone. The danger in building people up and putting them on pedestals as heroes is that when they turn out to be sinners in need of grace, we tend not to offer it so freely. Roethlisberger - God is Good! I like Ben Roethlisberger. I’ve been a fan since the draft (I thought his name was cool) and an even bigger fan since his rookie year. If you remember, he led the Steelers (one of my favorite teams) on a huge winning streak and into the playoffs – a fate few thought possible when an injury to starting QB Tommy Maddox thrust the highly touted 1st round draft pick under center for the rest of the season. And Roethlisberger’s success continued. He has led them to 3 Super Bowls (2 wins). But then there are the stories and allegations of careless behavior or outright sinfulness that surfaced. And as the dust settled on those episodes, and I came across articles and interviews that talked about Roethlisberger’s faith in God, and I found myself skeptical. “This may be something cooked up to improve his tarnished image” I thought. But then, my memory brought to my mind some things from my life. Poor choices, past mistakes, outright defiance. The difference is not that Roethlisberger was guilty and I was innocent. It is that his story was so much more known because of his fame, and mine were hidden from most of the world. Does that make my indiscretions any less sinful than Big Ben’s? No way. Christian recording artist Derek Webb on his cd “The House Show” talks about how the best thing that could happen to any of us is that our sins and indiscretions would be broadcast for all to see. That way we would have no place to hide, we would be more aware of our need for a Savior and people could (hopefully) move past judging us and get to helping point us back to Jesus. It is a scary thought, but I can’t find a reason that it isn’t truth! 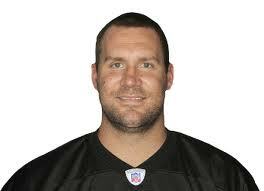 Roethlisberger - a 2 Time Super Bowl Champ! So I choose to acknowledge that I need a Savior as much as anyone, and I choose not to focus on the past that anyone has, because Jesus didn’t do that. John 8 shares a story of a woman who was caught in adultery. The religious leaders were trying to trap Jesus. He tells the crowd that those without sin can carry out the punishment of stoning this woman. They all realize they are guilty and leave. Jesus remains – He is the only one without sin and with the right to carry out the punishment. He instead chooses grace and mercy. Go and sin no more, he says. Hmmm. Seems like that is the example we should follow. Extend grace, show mercy, love our neighbors and work with them to “spur one another on toward love and good deeds”. Instead of judging their hearts that I can’t see. So the choice is ours. Will we fold our arms, shake our heads and condemn our fellow children of God, or will we go to the celebration of the lost sheep that are found and brought back to the fold? And will we remember when we were the lost sheep sought by a relentless shepherd? The truth is, like Roethlisberger said when after all the trouble he went through that brought him back to his faith, “God is good”. When we look at all that He has done for us, how can we say anything else? Who else on the Steelers are Christians? I’m not a Steelers fan , a Patriots fan. But I am a Christian and can definitely relate to the truths you speak of. Thanks for the info. Go Ben! Thanks for checking out my blog. I enjoy reading the stories of these athletes and seeing their human side that faces the same struggles and triumphs that we all do. I appreciate that God can speak to us through these stories and challenge us to live for Him. Again, thanks for stopping by. Come back again soon!